One of the most unpleasant things that a person can receive is a warning letter. While receiving a warning letter can be scary, writing one can also be difficult because you need to keep your emotions in check and maintain a level of professionalism; otherwise, you will end up in big trouble or in an embarrassing situation with someone. When hearing the term “warning letter,” the first thing that may come into our minds is that it is often addressed to someone who is working in a company or organization. 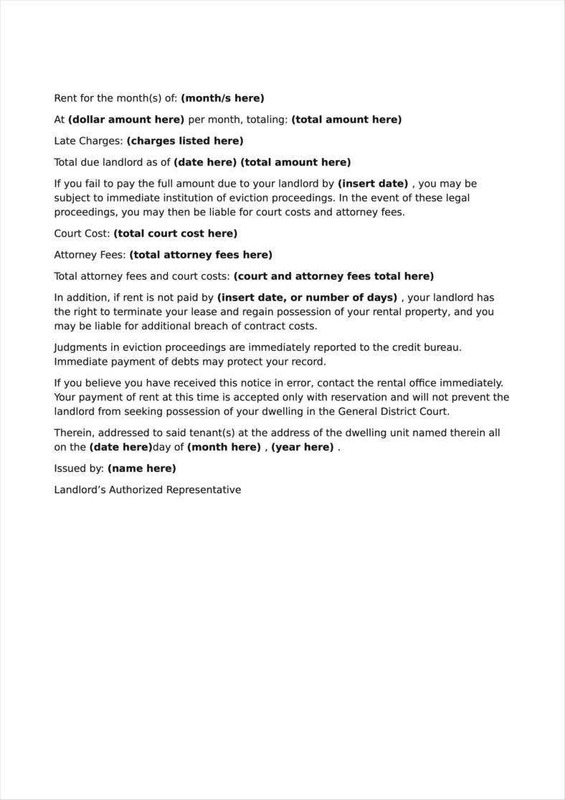 However, a warning letter is not only limited to work-related issues, but it can also be used to address problems about tenancy and other issues.to work-related issues, but it can also be used to address problems about tenancy and other issues. In this article, we have a provided essential information on the different functions of a warning letter. 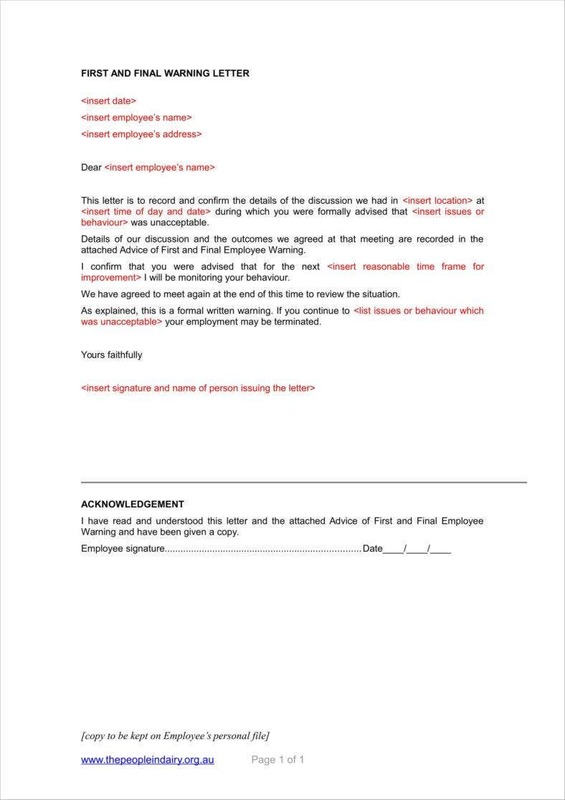 We also have provided a selection of free downloadable sample templates of different types of warning letters which content can be edited using certain types of software. A warning letter can come in different forms. But before we get to discuss the different types of warning letters, we need to know the general definition of a warning letter regardless of its purpose. 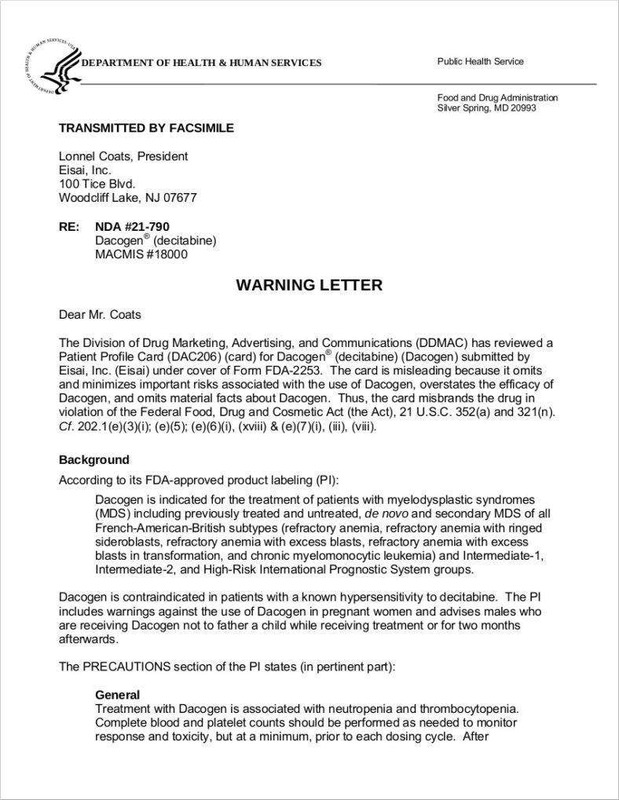 A warning letter is a document that provides a cautionary information to the recipient of the letter. 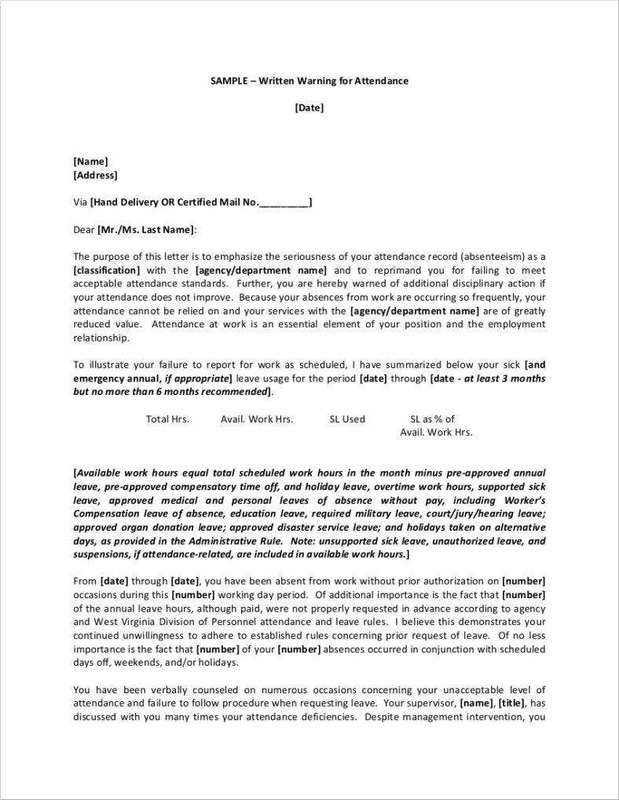 The main purpose of writing the letter is to warn the addressee about the violations made against the contract or agreements. Most types of warning letters contain potential sanctions or consequences that will be imposed to the recipient of the letter. When two or more parties have entered and signed a business contract, all parties are expected to adhere in performing their respective duties and responsibilities, as well as the rules and regulations that are stipulated and agreed on the contract. That is why when one of the parties has violated the agreement, it is only right to serve the erring party with a warning letter as soon as possible. 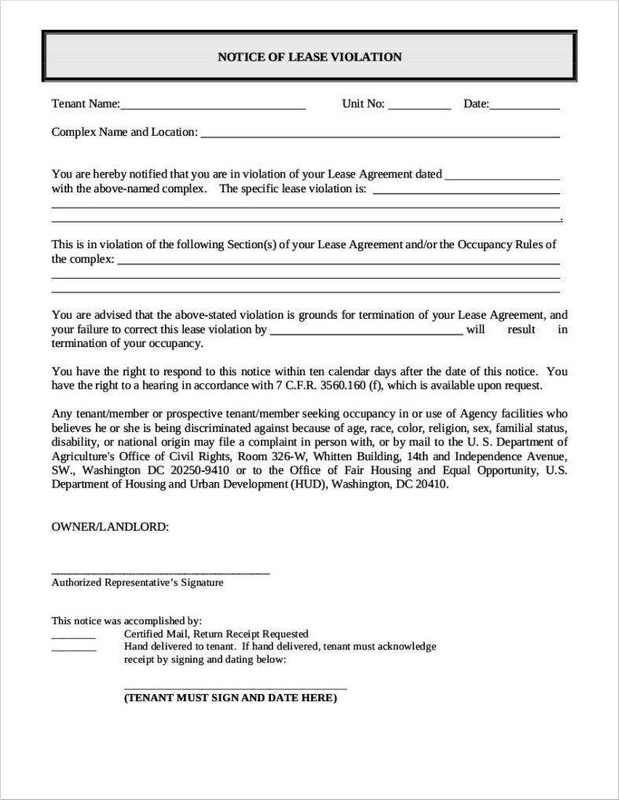 While the each type of warning letter is used differently, the primary purpose of a written warning letter is to once again bring the attention of the erring party about the violations made against the contract. 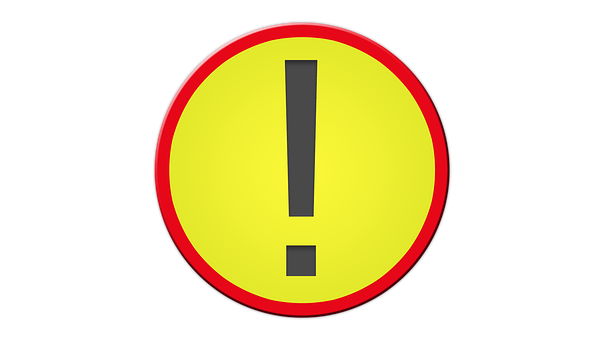 Verbal or Oral Warning – Informing the employee about his or her wrong actions verbally is the initial step that you should take. You can schedule a separate one-on-one meeting with the supervisor and the employee to discuss the alleged problem and hear out each side of their story. While a verbal warning is often used for minor offenses, it is still highly important to document everything that has been discussed during the meeting. 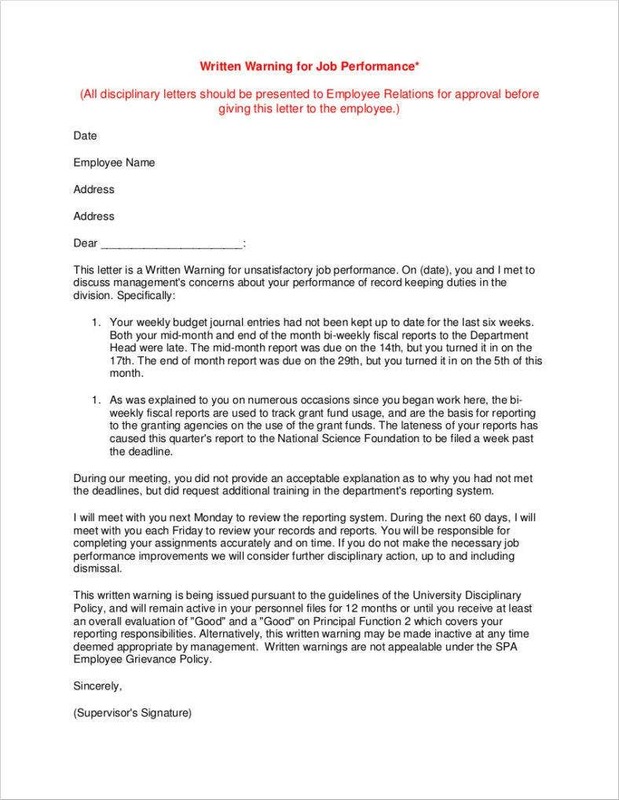 First Warning Letter – Serving an employee with a first warning letter signals him about his actions that are against the rules and regulations set in the company policy. The employer or HR manager can also state the potential sanctions that will be given to the employee in the future should he or she fails to make any improvements to address and resolve the issue. 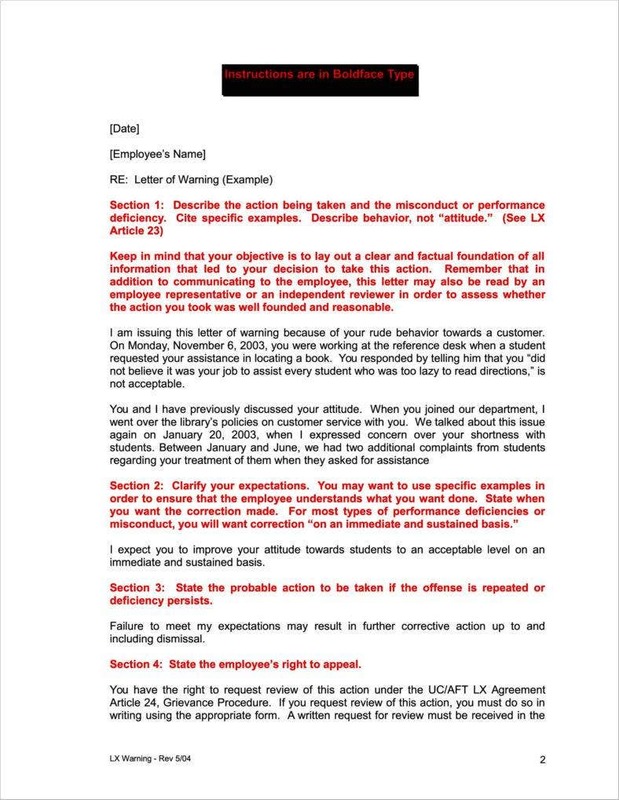 Final Warning Letter – This type of warning letter is usually given should the employee fails to comply with the disciplinary actions given by the company, make further improvement despite undergoing training and coaching, or has committed a serious offense against the company policy. A final warning letter often entails contract termination or dismissal from service and the company. 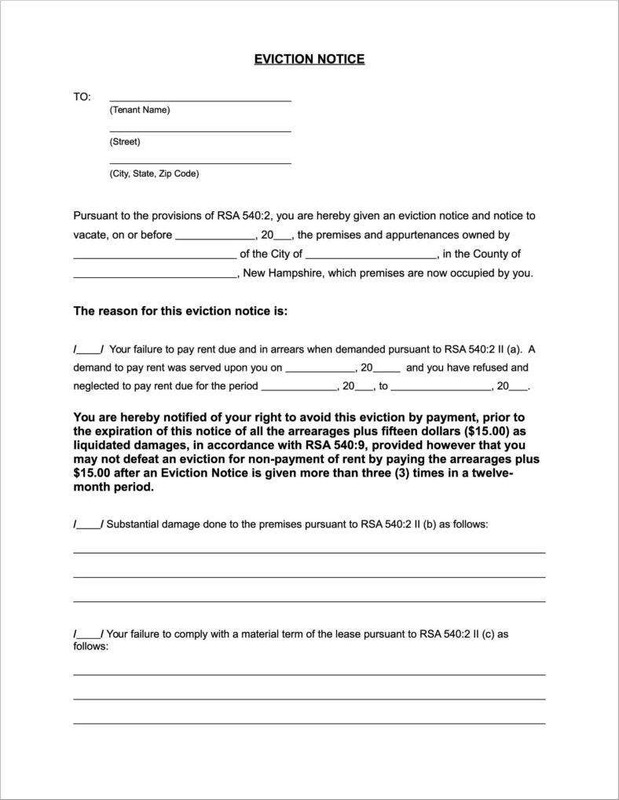 While an employee warning letter includes the potential sanction, a landlord can demand payment in case it is proven that the tenant has damaged an area(s) of the property, either intentionally or unintentionally. Now that we have already know the most common types of warning letters, you are now ready to formulate your own no matter what your purpose may be. 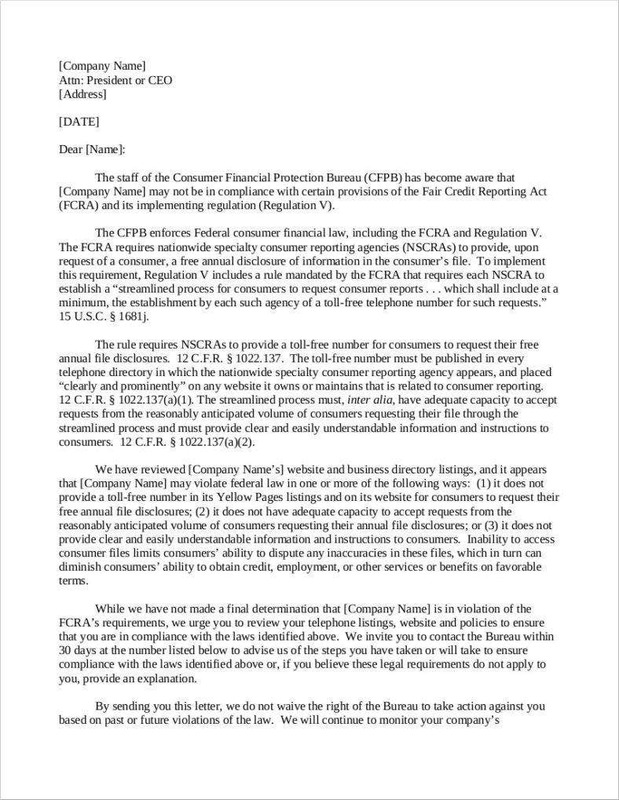 You may also want to check out our collection of company warning letters and the basic components of a warning letter for reference.